In South America there is a certain species of monkey called the Spider Monkey. It got its name from its long, spindly arms and legs, and the way it easily moves about from tree to tree to do its spider monkey things. The spider monkey also happens to be an important food source to the South American natives, and the natives have discovered a very easy way to capture them. They set up a simple gourd, with a hole just large enough for the monkey to stick his hand in. The natives put a particular type of nut in the gourd, and fasten it securely in a tree at sunset. Then, during the night, the spider monkey will discover the scent of food, stick his hand in the gourd, and grab the treat. It tries and tries to pull his hand out, but because he cannot remove his closed fist, and won’t let go of his prize, he is unable to escape. Come morning, the hunters return, bag the monkey, taking it captive. In our Scripture passage this morning Paul is warning the church in Philippi against falling to the temptation of pride and self-servitude. As with many warnings in Scripture, these come with instruction of how to avoid being caught in that trap. The first instruction Paul gives is to be united with Christ. Often one of the first things that comes to mind when we think of being united with Christ is to share in his suffering. While it is true that as Christians we will at some point be called to give up something for the sake of the Gospel, it’s not very encouraging. In fact, it may be very humbling, even humiliating. But Christ can take the humiliating things in our lives and make them glorious! Being united with Christ is something that brings about benefits. How often do we find comfort, compassion, tenderness, and mercy when we turn to Jesus? Even in times when we are called to give something up, even something major, for the cause of Christ, we receive His comfort. We receive His compassion. We receive the tenderness, grace and mercy. A few years back Jim and I were dealing with the issue of debt. I’ll confess – we had been lazy with how we handled our money, and found ourselves in significant debt, a debt the equivalent of about a year’s take-home income. One day I was at the local It’s A Grind, and one of the regular customers could see that I was upset. When he came over and asked what was wrong, I opened up to him a little bit. We talked briefly about how easy it is to fall into debt, that God does not want his people being controlled by money. We talked about how even though our troubles can seem to consume us with anxiety and worry, God is greater than our troubles, and God is big enough to consume what consumes us! Through my encounter with this man, I was able to receive God’s grace and compassion and comfort. But we don’t receive these gifts for the purpose of keeping them for ourselves. True, it feels good to rest in Jesus’ arms in times of trouble. But to leave it at that would be, well, selfish. We would only be building up ourselves, not anyone else. What if I encountered someone going through a struggle I’ve been through in my life? There are a few options I have. Option #1 would be that I could walk on by, and play it safe. After all, why reopen an old wound? Or, option #2, I could come along side of them, tell them I’ve been there, done that, and here’s how it turned out for me, and in essence, make it all about me so I can show off my battle scars. But neither of these reflects the comfort that I have received in Christ. 2 Corinthians 1:4 gives a better way to respond: We receive comfort from God so that we can comfort those in any trouble with the comfort we ourselves have received from God. Last year my friend Julie was preparing for major surgery and she admitted to me that she was afraid. I had never faced the kind of medical issues Julie was facing, and I pray that I never do. But I had been afraid before, and received comfort from Christ in the midst of that fear. Julie and I talked about her fear, what the worst outcome could be, that the outcome was in God’s hands, and that no matter what happened … Jesus loves me, this I know. Julie may insist the comfort she received was from me. I insist it was from Jesus. And because Julie received comfort, she is united with Christ, and she is better equipped to share God’s comfort with another person going through similar circumstances. It then becomes more of what God intended, that not only are we blessed, but we become a blessing to others. 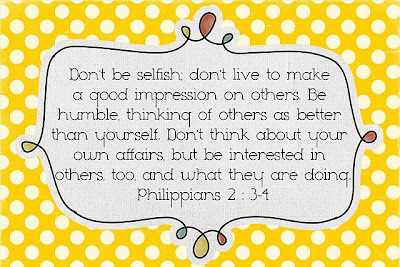 Paul continues, instructing us to do nothing out of selfish ambition. Rather, in humility, value others above ourselves, looking not to our own interests but also to the interests of others. That word “also” is very important. Paul is not implying that we ought to allow ourselves to be treated as doormats, taking care of no one but others. He is saying, however, we are not to live as though we are the only priority in life. We have heroes in every walk of life around us, although most will deny they ever did anything great. A couple of weeks before Christmas there was an apartment fire here in Long Beach. When the firefighters responded they learned that there was a two-year-old child trapped inside, helpless to escape on his own. Being firefighters, the crew did what firefighters do – they went in to the burning building, not knowing exactly what they would find or what dangers they may face, or even where to find the child in order to hopefully find him alive and bring him to safety. But before they could do this, they had to take care of their own safety as well. If they didn’t – if they did not receive the right training, if they did not put on their own safety gear, the jacket, helmet, gloves, oxygen, etc. – their efforts would have been in vain. The life of the child, and possibly the life of one or more firefighter, would have been lost. But because these men and women looked to their own needs also, the child’s life was saved. You and I might not know their names, and they may shy away from the recognition, saying it was just part of the job. But they are heroes all the same. They look not only to their own interests, but to the interest of the child, and they will without hesitation do the same for you and for me. In the same way constant preparation and training of these men and women fortify them in their daily jobs, our own daily actions that unite us with Christ – prayer, Bible study, fellowship – ought to not only fortify our own spiritual strength, but also be put into action to reach out to others in need of being strengthened. You and I might never be required to perform a dramatic act such as rescuing someone from a fire, but we can still be heroes, just by extending to another person the grace, comfort, compassion, we ourselves have received from Christ, and perhaps even lead them to be rescued from the fires of hell. But who is Paul to talk about looking to the needs of others? Didn’t he spend part of his life persecuting Jesus and his followers? And who am I, for that matter, to talk to you about this? I’ll be the first to admit that if my life had a city limits sign, it would say “Welcome to the Center of the Universe. Population: (count me, myself, I) Three. Elevation: Right up there with God. (slight pause) All I need is a little bit of humility, and I’d be perfect. It takes humility to look to the interests of others. It takes humility to remove yourself from the center of the universe and put someone else above yourself and look also to the interests of others. In the TV series “Undercover Boss” the president or CEO of a nationally known corporation poses as a front-line worker in a radical way to reconnect with their workforce. In one episode the owner of Waste Management Company left the executive office to work as an entry-level trainee, washing out a port-a-pottys and picking up trash on the ground at a local fairground for a day, and another day worked as a garbage truck driver, with a female employee whose basic needs were not being met when it came to relieving herself on the job. In the course of each day’s work, the owner also had the opportunity to learn more about the personal life of his new mentor, and how their work impacted not only the employees’ lives, as well as the lives of their families. The purpose was not just for the executive mucky-mucks to see how “the other half” lives; it was to help improve working conditions for the employees, which in turn improved their overall lives. In a similar way, God pulled off the ultimate “Undercover Boss” episode. Jesus – God in the flesh – voluntarily left the palaces and privileges of heaven to become one of us. He was born in poverty, in the filth of a stable. He took on the role of a no-status servant. Even though he was equal to God, Jesus was obedient to the Father’s will, even obedient to God’s will that he die on the cross, an execution that was reserved for the lowest and most reviled criminals, even though he had done nothing wrong. But why? What drove Jesus to obedience to the point of having nails driven in his hands and feet, to death on the cross? Very few people will die to save the life of someone else. Although perhaps for a good person someone might possibly die. Every day we find ourselves trapped in our sins, and like the spider monkey or the two-year-old trapped in the fire, we are unable to rescue ourselves. He shows his love for us in this way: While we were still sinners, Christ died for us. Like the Undercover Boss, God chose this radical move to reconnect with us. Jesus humbled himself in this way so that our relationship with God may be restored. God gives honor to the humble, and Jesus was no exception. God exalted Jesus to the highest place and gave him the name above every name. But Jesus didn’t go through all he did for his own glory. After all, he is Lord of lords, King of kings. He had nothing to gain from his humility and humiliation. If Jesus had not humbled himself and become one of us we’d be subject to a set of rules and laws intended to instill holiness in us. But because of our sinful nature we are unable to keep these laws, and as a result, can never attain holiness on our own. Our failure to keep the law only shows us how short of perfection we fall. But because Jesus traded the heavenly realms for the hill of Calvary we are the ones who gained. We gained forgiveness. We gained mercy. We gained grace, and comfort, and compassion. We gained holiness, imparted to us by Christ Himself. We gained the right to become children of God. We are co-heirs with Christ to the Kingdom of heaven and the eternal life that comes with it. I encourage you to read the book of Philippians. When you do, you will notice that the recurring theme throughout is “joy.” As a mentor to the church in Philippi, Paul urges the Christians to make his joy complete, by being like-minded with Christ and each other, sharing the same love, and looking to the needs of others. The message is simple – JOY (J-O-Y) is made complete by serving Jesus first, then Others, then You. Amen.